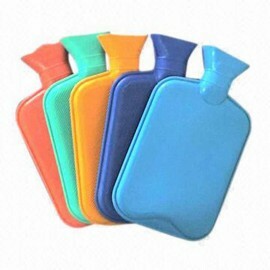 Hot water bags, also called hot water bottles, are rubber bags filled with hot water and used for heat therapy. Use hot water bottles to manage pain, such as headaches or arthritis, or to keep yourself warm on a cold night. Great for heat therapy of sore tens muscle. Cold chest or whenever want to feel warm and cozy. Fill the hot water bag with hot water from the tap. Check the water temperature; it should be between 104 and 113 degrees Fahrenheit. Squeeze the hot water bag gently to remove air; replace the cap or plug. Make sure the seal is tight enough to prevent water from leaking out. Wrap the hot water bag in a towel to prevent direct skin contact with the heat. Place the hot water bag on the affected area. If it is too painful, wrap the hot water bag in another towel to decrease the temperature, or place the hot water bag directly above or below the affected area. Apply heat to the affected area for 20 to 30 minutes. If the hot water bag gets too cool, refill the water, and check the temperature again.